Whale watching is an amazing adventure and this boat takes you into the waters off Kaikoura, New Zealand for a look at the marine life of New Zealand. This whale watching boat takes you on a magnificent journey to locate Sperm Whales off Kaikoura on the South Island of New Zealand. Whale Watch Kaikoura is a well known Company that heads out to a place with amazing scenery to explore the natural habitat of the Sperm Whale. Whale Watch Kaikoura is a family owned business that was created due to family legends and their involvement with the Sperm Whale. In desperate times, the Sperm Whale once again helped the Maori community to solve some answers to the hardships of the town. Kaikoura Whale Watch has brought good things to the Maori people as well as to the Sperm Whale as tours show visitors the reality and beauty of the life of a Sperm Whale. Wheketere is the name of this whale watching boat that is operated by Whale Watch Kaikoura on the South Island of New Zealand. This special type of Catamaran is one of four and is designed especially for a Sperm Whale watching tour. This boat has an extremely quiet engine so you can listen to the underwater hydrophones for any sperm whales in the area. 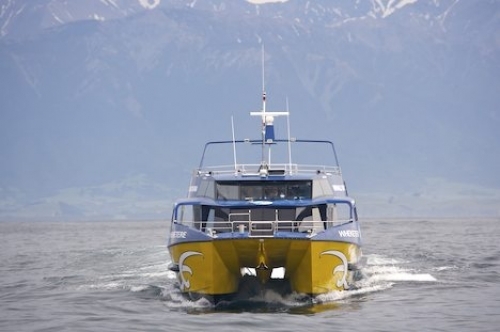 With a large outside deck and an enclosed cabin, Whale Watch Kaikoura ensures you a memorable experience. Whale watching on one of the catamarans of Whale Watch Kaikoura has become one of the top tourism adventures to do while visiting New Zealand. Venture out into the vast waters for a look at some of New Zealand's amazing wildlife that resides around Kaikoura. Whale watching vessel the Wheketere operated by Whale Watch Kaikoura, Kaikoura, South Island, New Zealand.